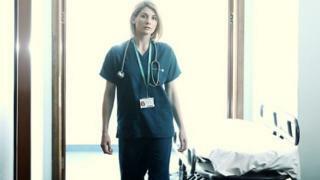 Image caption Jodie Whittaker in the BBC series "Trust Me" - the story of a "Quacksalver"
Snout-fair, dowsabel and percher are among 30 "lost" words which experts believe are still in current use. Researchers have drawn up the list to persuade people that these defunct words can still have a relevance. Snout-fair is a word for handsome, dowsabel means "lady-love", and a percher is a social climber. Dominic Watt, senior linguistics lecturer at the University of York, said he hoped people would re-engage with the language of old. The team spent three months searching through old books and dictionaries to create the list. Mr Watt wants to bring these words back into modern conversations. "We've identified lost words that are both interesting and thought-provoking, in the hope of helping people re-engage with language of old," he said. "Snout-fair", for example, means "having a fair countenance; fair-faced, comely, handsome", while "sillytonian" refers to "a silly or gullible person, esp one considered as belonging to a notional sect of such people". "Dowsabel" is "applied generically to a sweetheart, 'lady-love'". Margot Leadbetter, the snobby neighbour from 1970s BBC sitcom, The Good Life, could be seen as an arch example of a "percher" - someone "who aspires to a higher rank or status; an ambitious or self-assertive person". The BBC series Trust Me is the story of a "quacksalver" - a person who "dishonestly claims knowledge of, or skill in, medicine; a pedlar of false cures". Image caption Joey Essex: "Snout-fair" to some, to others a "sillytonian"
The list of 30 "lost words" are grouped into three areas the researchers feel are relevant to modern life: post-truth (deception); appearance, personality and behaviour; and emotions. The final list also includes the words "ear-rent" - described as "the figurative cost to a person of listening to trivial or incessant talk", "slug-a-bed" - meaning "a person who lies in late", and "merry-go-sorry" - a phrase used to describe "a mixture of joy and sorrow".